Martin Feldstein, who was chairman of the Council of Economic Advisors under President Reagan and is currently a Harvard professor, wrote an extraordinary editorial in the Wall Street Journal in which he strongly advocated that the Federal Reserve pursue policies that would: 1) continue to raise interest rates; and 2) thereby pop asset bubbles in the stock and commercial real estate markets; 3) which would cause an estimated $9+ trillion in investor losses; 4) possibly lead to another recession and the accompanying major job losses; and 5) would be followed by forcing interest rates down again to near historic lows. Now, the eminently respectable Professor Feldstein and other mainstream economists are not intentionally trying to hurt investors, that is not the reason to raise rates. Quite the reverse, this is all supposed to be for our own good, and the intentions are to over the long term help economic growth and create healthier investment markets. What Feldstein is advocating will on the surface make no sense whatsoever to great majority of the people whose retirement accounts and other investments are at risk - it is entirely outside the usual ways in which most people think about investing. Yet, it is perfectly logical as a matter of monetary policy and macroeconomics, and is quite consistent with the Federal Reserve's current policy of frequently raising interest rates in practice. 1) To explore in detail what Feldstein is proposing and explain why he is proposing it with the best of intentions. 2) Using Feldstein's proposal as a tangible framework, understandably link what may seem esoteric to many people with the overwhelming practical implications for their personal lives and financial outcomes. We live in an age in which extraordinary and unconventional Federal Reserve actions still dominate the investment markets to an unprecedented degree - and not understanding what is happening, why it is happening and what may be coming next, provides no protection to investors whatsoever. 3) To lay out how what Feldstein is proposing (or something like it) would create a sequence of major price movements across the markets, including bonds, stocks, real estate and precious metals, that would not be a "random walk" - but can be understood in advance. This could allow for the use of two cycles of investment arbitrage strategies. "Save Low Interest For A Rainy Day"
Feldstein's editorial is titled "Save Low Interest for a Rainy Day" (linked here), and was written this past summer in response to President Trump's public statements urging the Fed to reverse course and stop increasing interest rates. "In complaining publicly about the Fed, Mr. Trump is breaking decades of presidential precedent, and he is wrong on the substance. The Fed actually is behind the curve in normalizing short-term interest rates, and it should now raise the federal-funds rate at least four times a year." While Dr. Feldstein is not part of the Federal Reserve, he is an eminent economist and a member of the Wall Street Journal's board of contributors. What he is advocating is not particularly controversial, but rather it is in the current heart of conventional macroeconomic theory, and in his editorial Feldstein is presenting the defense of the status quo against Trump's statements. "But controlling inflation isn’t the primary reason for the Fed to keep raising the short-term interest rate. Rather, raising the rate when the economy is strong will give the Fed room to respond to the next economic downturn with a significant reduction. That downturn is almost surely on its way. The likeliest cause would be a collapse in the high asset prices that have been created by the exceptionally relaxed monetary policy of the past decade." It is refreshing to see such a prominent economist so succinctly describe what has been happening in an article intended for the general public rather than his peer group. As I have been writing about in analyses and presenting in workshops for a number of years, creating exceptionally low interest rates has always been likely to create surging asset prices over time as a quite predictable side effect, with possible bubbles in multiple asset categories. Unfortunately, however, this essential process that is so critical in determining investment results is very difficult for most non-economists to grasp because it seems so counter-intuitive. Common sense would tell us that containing the lingering damage from a market and economic crisis should lead to low asset prices - but in practice, over the last 20 or so years, that is not at all how the markets have worked. "It’s too late to avoid an asset bubble: Equity prices already have risen far above the historical trend. The price/earnings ratio of the S&P 500 is now more than 50% higher than the all-time average, sitting at a level reached only three times in the past century. Commercial real-estate prices also are extremely high by historical standards. The inevitable return of these asset prices to their historical norms is likely to cause a sharp decline in household wealth and in the rate of investment in commercial real estate. If the P/E ratio returns to its historical average, the fall in share prices will amount to a $9 trillion loss across all U.S. households." As President Emeritus of the National Bureau of Economic Research, Martin Feldstein is clearly viewed by his peer group as being in the most respectable core of the economics profession. Based upon his long experience, there is simply no doubt in his mind whatsoever that we currently have major asset bubbles in at least the stock and the commercial real estate markets (with those bubbles being the result of previous Federal Reserve policies). A simple reversion to the mean would by Feldstein's estimate trigger $9 trillion in losses and remove 33% of the current value of the stock markets. That would be a 33% reduction in investment value for every household and retirement investor in the nation who is heavily invested in stocks. There is also the issue of the millions of retirees and retirement investors who moved to REITs in the search for cash flow, as a result of the Fed's previous zero interest rate policies. Those REITs have become the foundation of their lifestyle and financial security - and that means that if Feldstein is correct and at least the commercial property REITs are in a major bubble, there could be potentially devastating personal consequences. Two other relevant issues can be seen in the graph above from a previous financial analysis (linked here). 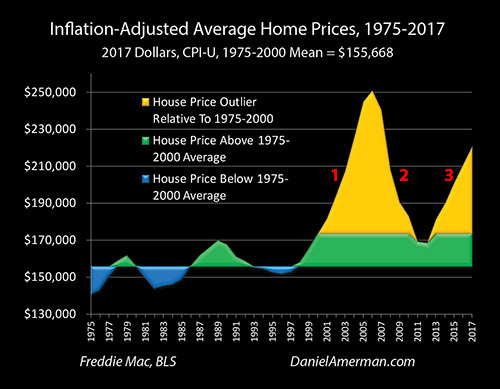 If we look at the "old style" real estate markets of 1975-2000 on the left side of the graph - then reversion to the mean does not mean just returning to average. The mean is the middle, and the other half of the time is not average but below average. So if we go down from the top, we don't usually stop in the middle but keep right on going to other side, which could easily mean a bottom to the cycle in the 50% or greater loss range, translating to a loss in household wealth in the $13-$14 trillion range or more, just from stocks alone. Also, as can be seen in the golden spikes on the right side of the graph, the very high asset prices that can result from "exceptionally relaxed monetary policy" are not restricted to just stocks and commercial property, but extend to single family homes as well. "Raising rates does increase the risk of bursting the asset bubble sooner than investors and consumers might hope. But the Fed has let the economy grow fragile by keeping short-term rates too low for too long. Now it must respond by raising rates enough to deal with the bubble burst when it inevitably comes." The above excerpt is the "money quote", and has been brought been forward from the end of Feldstein's editorial because it frankly and understandably establishes causality to an unusual degree for a public statement by someone at his level. Feldstein (and his economist peers) know perfectly well that if the Fed continues with its current policies of raising interest rates an expected four times a year - thereby following his advice - that it could bring forward in time the day the bubbles pop, and could easily cause $10-$20 trillion in total losses for aggregate household net worth in the United States. But nonetheless - with full knowledge of what would likely happen - Dr. Feldstein is still strongly advocating that the Fed continue to raise interest rates on a frequent basis. "Large drops in household wealth are usually accompanied by declines in consumer spending equal to about 4% of the wealth drop. That rule of thumb implies that a $9 trillion drop in the value of equities would reduce consumer spending by about 2% of gross domestic product— enough to push the economy into recession. The fall in the value of commercial real estate would add to the decline of demand. And with consumer spending down sharply, businesses would cut back on their investment and hiring." Increasing interest rates that pop asset bubbles can lead to other consequences as well. As Feldstein explains in his editorial, there is a very good chance that a recession will follow, with the accompanying losses in consumer incomes and increases in unemployment. And because Feldstein believes an eventual popping of bubbles is inevitable anyway, he therefore implicitly saying that an eventual recession is likely inevitable as well. "But significant monetary stimulus would be impossible to achieve if the short-term interest rate remains at the current 1.75%. And there is less room than ever for fiscal stimulus, as annual deficits will exceed $1 trillion by 2020 and federal debt will be greater than 100% of GDP by the end of the decade. That’s why it’s important for the Fed to raise the federal-funds rate to 4% over the next two years, which would allow it to cut the rate by at least three points when the next recession begins. Such a rate reduction might not be enough to prevent a recession within the next two years, but it would maximize the Fed’s positive influence on the economy." As Feldstein briefly touches upon, we are currently a heavily indebted country, and the extremely expensive fiscal "trick" of quickly doubling the national debt in a few years (and creating decades of subsequent financial pain) in the attempt to use massive governmental spending increases to exit recession is not available to us like it was the last time around. So that leaves monetary policy, i.e. Federal Reserve actions - if a very long future recession or possible depression is to be avoided when the asset bubbles inevitably eventually pop. For monetary policy to shorten the coming recession and set the base for the next recovery, current economic theory demands the ability to sharply lower interest rates - by "at least" 3% in Feldstein's professional opinion. If the Fed doesn't significantly raise interest rates before later sharply reducing them, then the only way to reduce rates by 3%+ is to go to negative interest rates (like Japan and Europe), and that is a risky and unconventional place that economists would strongly prefer to avoid. So stuck between a rock and hard place, with interest rates far too low coming into a looming asset-bubble induced market crash and subsequent recession - a mainstream economic view (which is what Feldstein is succinctly explaining as his response to Trump) is that interest rates must be raised for the long term good of the nation, and the quite predictable near term consequences for retirement investors and retirees (and elections) be damned. A Familiar "Movie Plot Line"
If what Martin Feldstein is writing about comes to pass, then tens of millions of lives are likely to change - and in most cases it will for the worse, at least over the next few years. Tens of millions of people are making investment choices that are completely blind to the subject of this analysis as well as what is advocated in Feldstein's editorial. They are following what they think is the best available investment advice - the accepted conventional wisdom - which is that they need to be heavily invested in stocks as the reliable basis for their financial security in retirement. And at this point, with the stock indexes at record or near record highs, many of these investors are feeling very comfortable and happy with their choices, with a great deal of confidence about their future financial security. It would never occur to them that the little understood but extremely powerful institution that controls money itself would be using its powers in a way that would 1) create an "exceptionally relaxed monetary policy" that was likely to eventually create asset bubbles in stocks and real estate and predictably draw in retirement savers like moths to the flame in the process; and would then 2) more or less intentionally pop those bubbles as the necessary byproduct of raising interest rates in order to be able to better contain the crisis that is likely to result from the bubbles eventually popping anyway. This process is happening right now, in plain sight, but the mindset involved in understanding the investment implications of the applicable macroeconomics and monetary policy is so foreign to the way most people view retirement investments, that it can't be seen or taken into account. And what is most ironic of all is that for those of us "of an age", this is far from our first rodeo. This is our shared experience, we've seen this happen twice before in the last 20 years. As explored back in March in my analysis "The ABCs Of Popping A Third Asset Bubble" (linked here), there has a been a familiar "movie plot line" that has dominated the markets over the last 20 years. D) The higher interest rates contribute to the popping of the asset bubbles, leading to market crashes, a recession, and setting the stage to return to "A" in the next cycle. The March analysis ended by asking whether we were currently at stage C, with the Fed raising interest rates during a time of asset bubbles, and whether that would lead to D once again, with the asset bubbles popping, market crashes and a new recession? When I first read Feldstein's editorial, I felt like I was watching a veteran director emeritus enter our shared "movie set", and begin frankly and publicly barking out directions for how to complete the familiar plot line for the third time, while setting the stage for the fourth movie. Yes, he stipulates as matters of fact that we do have at least two asset bubbles (Act B), as a result of previous "exceptionally relaxed monetary policy" (Act A). Yes, the Fed is currently raising interest rates (Act C), and as a famous and successful 79 year director who has been living with at least somewhat related plot lines for his entire professional career, he is calling for the pace of the plot to accelerate, for the rate increases to keep coming until the dramatic climax of the plot - Act D - is (again) reached, the bubbles pop and the markets crash, the hordes of extras (retirement investors) are tragically but necessarily sacrificed, the next recession arrives - and most importantly, for the movie to end with enough "ammunition" in the form of room to reduce interest rates, that it will enable Act A to get off to a successful start in the next movie in the series, exiting crisis and rebooting the economy. We've all seen this plot line before. We've all lived variations of this plot line before. But yet, it is a key part of the plot that when the extras get sacrificed (again), the arrival of Act D will come as a complete and total shock to most of them. If the Fed continues to follow the path that Feldstein advocates - as it has been doing to date - then that could lead to devastating financial losses for many millions of retirement and other investors. Despite the ongoing public discussion of what would cause this devastation, it would nonetheless completely blind-side most of those who would be harmed, because relatively few investors understand the Federal Reserve or how its actions have dominated markets over the last almost 20 years. For those who are aware - what Feldstein proposes could also be called a road map to what could be two of the largest arbitrage opportunities of our lifetimes in the bond, stock, real estate and precious metals markets. How these two opportunities could be created in sequence - in a manner that is not a "random walk" - will be covered in the second part of this analysis. A detailed analysis of these potential opportunities is also linked here.